We are planning to install an important new release of QuestionPoint this coming Sunday, March 2, in the early morning. The system will be brought down at 0800 GMT and is planned to remain down for 60 minutes. As always, the announced duration of downtime is an approximation: the system could be available in less than an hour, or it could extend beyond that. Should we become aware of the need to remain down longer, we will notify this list. At the end of this post will be a brief description from the release notes of the new features and changes to existing features. Most of the additions will have little immediate effect on your daily work; they are capabilities that your institution can choose to implement if it wishes. Exceptions for some users are the chat patron viewport change from left to right (section 1.1) and the enhancement to queue management (section 1.7). The impact of the feature changes, Section 2 in the attached, is also likely to be minimal to your daily workflow, but you should read about them to be aware of the changes. The attached file will also be posted to the QuestionPoint blog at http://questionpoint.blogs.com. We look forward to your reactions to the new features of QuestionPoint. The patron chat interface will now more closely resemble what has been available for preview as Chat 2. To meet accessibility requirements, the viewport and chat box/transcript area have switched sides: the viewport for the patron will now appear on the right side of the screen, and the chat box and transcript on the left. 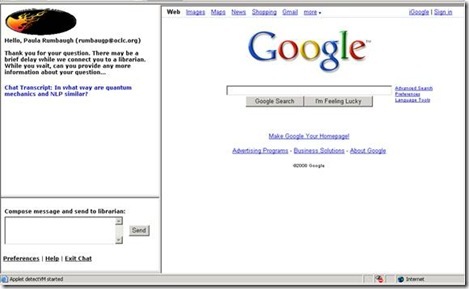 Co-browsing will also take place on the right side instead of the left. In addition, patrons will be able to set preferences, changing font faces and sizes, color combinations, and whether or not they want an audible signal when a new message comes in. The first phase of the QuestionPoint Forms Manager is now available to create email web forms. Institution Administrators can now have QuestionPoint host all patron email web forms for your library’s QuestionPoint service. Further, the administrator can set up the forms that are e-mailed to the QuestionPoint service exactly as they want them to look. (In the future, they’ll be able to do the same with the chat forms.) Having QuestionPoint staff manage your chat forms for you remains an option until the chat form manager becomes available in future releases. 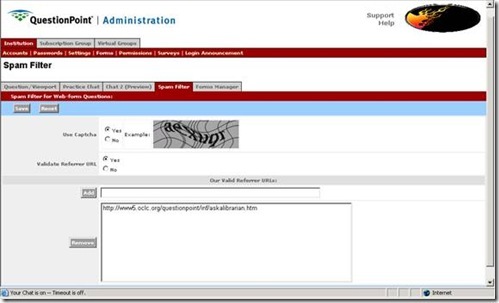 · Easy to use and reduces the need for IT staff involvement in your forms. · Lets you customize your forms. · Provides forms in multiple languages. · Supports improved access to data about reference transactions. · Provides improved protection against spam. With this install, the QuestionPoint team introduces the Qwidget, a Meebo-Me-like chat box that libraries can place anywhere on their website, at the patron’s point of need. Like similar widgets (see below), the Qwidget will enable the library to indicate when a librarian is on duty and when not. You’ll also be able to set the widget up to give the patron the option of redirecting a question through e-mail if chat is not “open.” But unlike the familiar, commercially available widgets, the Qwidget will allow multiple concurrent sessions on the librarian side. Mounting of the Qwidget is a decision each library can make. Only the library’s primary queue will see sessions coming in via the Qwidget. 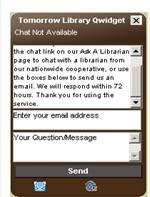 Libraries must be using the Flash-based chat to see Qwidget sessions. Institution Administrators will find the Qwidget set-up at Administration/Institution/Forms/Forms Manager/ Create Qwidget (Preview). Complete instructions for set-up will be in Administration Help and at http://questionpoint.org/support/documentation . Group Administrators will now have the ability to brand QuestionPoint’s patron interface. The Administrator can add the logo of the group (or institution, if only one) and change the colors to more closely resemble other group websites and marketing pieces. Links to other group resources can be added as tabs to the top of the pages. The following illustrations show the set-up page and the page as it will appear to your users. Complete instructions for set-up will be in Administration Help and at http://questionpoint.org/support/documentation . 1. 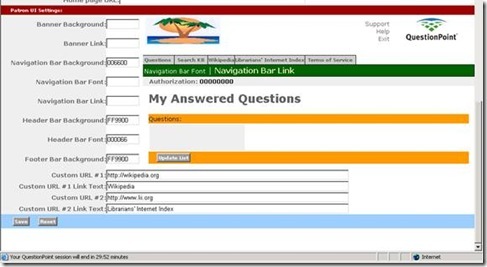 Have QuestionPoint host the library’s patron intake forms. Although not 100% guarded against spam, the OCLC firewall has proven quite reliable for the 24/7 Cooperative hosted chat forms, and similar results are expected for the newly available hosted webforms. 2. 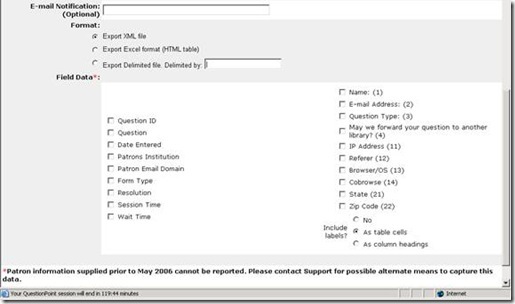 Select the option for QuestionPoint to validate the referrer page before accepting the form information into the system. You may enter more than one URL, to cover all those pages on which you have a form. Since many spam bots are using a cached or a local version of your web form, their submitted forms will not match the referring URL(s) you list. Any form data coming from any site other than those you indicated will be ignored. 3. Use the Captcha tool to force the user to enter the characters they see in the randomly generated graphic. This kind of recognition still requires the human eye, so bots cannot pass the test. Administrators will find the second two options at Administration/Institution/Forms/Spam Filter. The first option is automatic when you choose to “publish” a form through forms set-up at Administration/Institution/Forms/Forms Manager. Institution, Group, and Ask Administrators can now produce reports for the institution’s older transcripts and transactions in Service History. The first phase of “queue management” to be implemented will make it easier for librarians to claim their own patrons from the chat queue before they are picked up by librarians in the next level queue, e.g., by a Cooperative librarian. 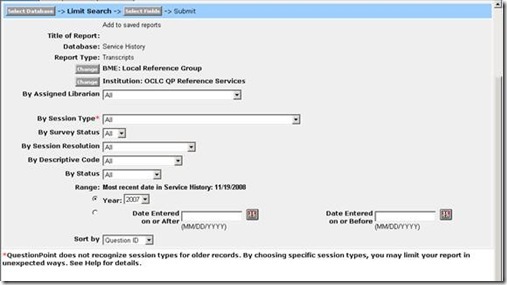 Session requests will first appear only in the home library’s primary queue for 40 seconds. If the patron has not been picked up in that time, the session will roll to the next level queue (e.g., the Cooperative queue), where any monitoring librarian can claim the session. For the Cooperative, as always, only after two minutes of waiting will the patron be picked up by a Back-up librarian. Important note: There will no longer be an asterisk to let librarians know the home library of a waiting patron is monitoring. Once a session appears in a librarian’s monitor, that session may be picked up by that librarian. No further waiting is necessary. As QuestionPoint developed and grew, different reporting needs were identified and added to the existing interface. These additions and enhancements eventually resulted in three locations within QuestionPoint from which to retrieve statistics on your usage. Adding to the complexity was the fact that access to reports is based on permissions level. So not only were users sometimes not sure where to go to get which statistics, some librarians could see institution statistics and some could not. 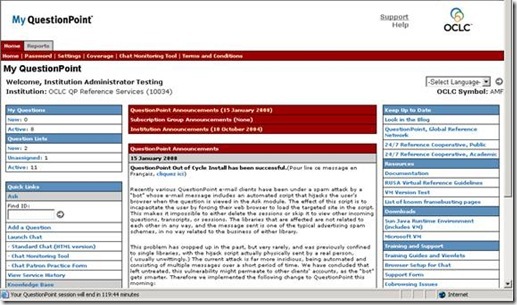 The March 2008 release brings all QuestionPoint statistics together into one module, accessible from the My QuestionPoint page. Behind the Reports tab, all users will see report links, based on the permissions level of their login number. All librarians, regardless of permissions level, will be able to see statistics of their own usage and statistics for their institution-wide usage. 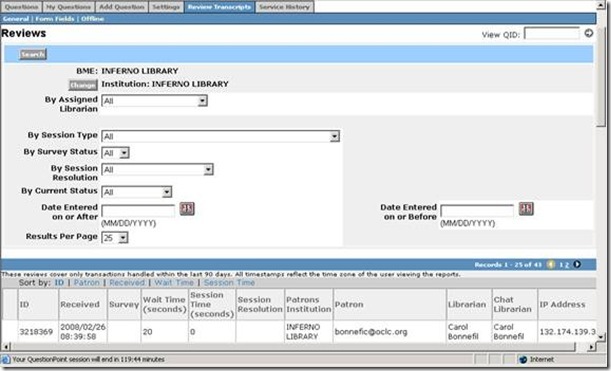 The next illustration shows that users with institution administrator authorization will see more reports, including those for each librarian of the institution. They will also see a link for suggesting new reports. Librarians without the administrator permissions will not see those links. But everyone will have access to the system-wide statistics and QP Usage. Institution and Group Administrators will find that all reports previously available in the Administration module, now appear here, under the Reports tab on My QuestionPoint. All Administrators: Four reports previously available in the Ask module were also moved to the new location. Administrators: In the illustration below, you see that Review Transcripts has replaced the old Reports tab. In addition, note that several of the reports that just gave statistics no longer appear as links in this area. Instead, only those features that truly allow you to review transcripts, rather than numbers, appear here. A second change is for the table on the General Reviews page. A new column, called Chat Librarian, appears. 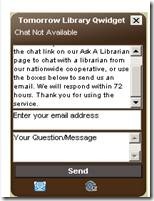 Together with the Librarian column, administrators can see who picked up a chat session originally, as well as who the most recent librarian to have handled the session or transaction is. If your institution or group has not substituted your own logo on the QuestionPoint interface, you will note the new logo in the upper right of every page. This represents OCLC’s new, global look! Administrators: Prior to this install, only the most recent librarian to have touched a transcript/transaction was reported in the reports available in Ask (now renamed My QuestionPoint/Reports and Ask/Review Transcripts). This sometimes caused unexpected results when looking at the Sessions reports, especially in reporting how many patrons from other libraries your librarians helped. After the March install, QuestionPoint will be able to report chat librarians. Thus, the counts and linked transcripts you see for Sessions and Sessions by Authorization should deliver the expected results for transcripts created from the time of the install forward. Institution and Ask Administrators: Since April 2007 the General report default search had a limit set, Status = All (Not deleted). The Status field has been set to All, or no limit. This should fix the problem in which administrators were unable to see certain transcripts their librarians participated in unless they changed the Status limit. 3.3 Librarian chat not appearing. Back end changes to the system were made to improve method by which librarian chat is recorded and stored. This should resolve the intermittent (and rarely seen) phenomenon of librarian chat not appearing in chat history or transcripts.